People from blood groups A, B and AB are more at risk of heart disease than those with the more common blood type O, a study suggests. Those with the rarest blood group, AB, are the most vulnerable - they are 23% more likely to suffer from heart disease than those with blood group O. The researchers do not know why this is, but are now looking at how blood groups respond to improved lifestyle. The findings are published in an American Heart Association Journal. The study also found that for individuals with blood group B the risk of heart disease increased by 11%, and for blood type A, by 5%. Lead author Prof Lu Qi, from the Harvard School of Public Health in Boston, said: "While people cannot change their blood type, our findings may help physicians better understand who is at risk of developing heart disease. "It's good to know your blood type the same way you should know your cholesterol or blood pressure numbers. "If you know you're at higher risk, you can reduce the risk by adopting a healthier lifestyle, such as eating right, exercising and not smoking." The British Heart Foundation stressed it is important that we all look after ourselves to reduce the risk. Doireann Maddock, a senior cardiac nurse from the charity said: "Nobody can influence what type of blood they are born with but a healthy lifestyle is something everybody can have an influence over. "Eating healthily, getting active and stopping smoking are the types of things you should be worrying about, not your blood type. "While these findings are certainly interesting we'll need more research to draw any firm conclusions about blood type and its role in heart disease risk." The study did not look at why different blood types appear to have different risks of heart disease. Prof Qi said: "Blood type is very complicated, so there could be multiple mechanisms at play." 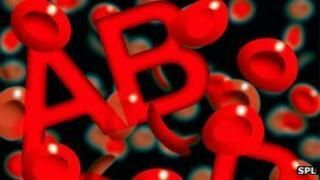 However, blood group AB has been linked to inflammation, which plays an important role in artery damage. There is also evidence that blood group A is associated with higher levels of the 'bad' type of cholesterol, low density lipoprotein (LDL), a waxy substance that can clog arteries. While those with blood group O may benefit from increased levels of a chemical which helps blood flow and clotting. The findings are based on two large US analytical studies - 62,073 women from the Nurses' Health Study and 27,428 adults from the Health Professionals Follow-up Study. They were between the ages of 30 and 75 and followed for 20 years. As this study group was predominantly Caucasian, the researchers say it is not clear if their findings would be reflected in other ethnic groups. The work is published in Arteriosclerosis, Thrombosis and Vascular Biology, an American Heart Association journal. The team is now looking at whether people with different blood groups respond differently to changes in lifestyle, such as diet, exercise, cholesterol intake.